The Republic of Mozambique is located in southeastern Africa bordered by the Indian Ocean to the east, Tanzania to the north, Malawi and Zambia to the northwest, Zimbabwe to the west and Swaziland and South Africa to the southwest. The capital city is Maputo. Total area is 801,590 km2 (309,496 sq mi) and the 2009 estimated population was 22,894,000. The area was explored by Vasco da Gama in 1498 and colonized by Portugal in 1505. Mozambique became independent on 25 June 1975, and became the People's Republic of Mozambique shortly after. It was the scene of an intense civil war lasting from 1977 to 1992. The Macua are the dominant group in the northern part of the country and about 95% of them are Muslim; the Sena and Shona (mostly Ndau) are prominent in the Zambezi valley, and the Shangaan (Tsonga) dominate in southern Mozambique. Other groups include Makonde, Yao, Swahili, Tonga, Chopi, and Nguni (including Zulu). Bantu people comprise 97.8% of the population, with the rest including White Africans (largely of Portuguese ancestry), Euro-Africans (mestiço people of mixed Bantu and Portuguese heritage), and Indians (approximately 45,000). According to the 1997 census, 32.8% of the population of Mozambique was Roman Catholic, 27.8% was Muslim, and 17.5% was Protestant. 16.8% of the people held other beliefs, mainly animism, and 5.1% had no religious beliefs. Mennonite involvement in Mozambique grew out of assistance given by Mennonite Central Committee and Eastern Mennonite Board of Missions and Charities (Mennonite Church) to Mozambican refugees in Tanzania during Mozambique's independence struggle of the 1960s. Occasional visits by MCC personnel, 1974-1975, led to the shipment of medicines in 1976 via the American Friends Service Committee. Representatives of the Kanisa la Mennonite Tanzania and MCC established a relationship with Christian Council of Mozambique and local churches in 1978. Regular shipments of material aid were made to Rhodesian refugees in Mozambique before 1982, and 18,000 tons of cereals were shipped by MCC and distributed under the auspices of the Christian Council to flood, war, and drought victims in Mozambique, 1982-1986. Harold Wenger (Eastern Board missionary) in Swaziland developed contacts with African Independent Churches, 1978-1980. Central Intelligence Agency. "Mozambique." The World Factbook. Web. 14 April 2011. https://www.cia.gov/library/publications/the-world-factbook/geos/mz.html#People. Mennonite World Conference. "2003 Africa Mennonite & Brethren in Christ Churches." Web. 2 March 2011. http://www.mwc-cmm.org/Directory/2003africa.html. Mennonite World Conference. "Mennonite and Brethren in Christ Churches Worldwide, 2009: Africa." Web. 2 March 2011. %20Summary.doc http://www.mwc-cmm.org/en15/files/Members%202009/Africa%20Summary.doc. Wikipedia. "Mozambique." Web. 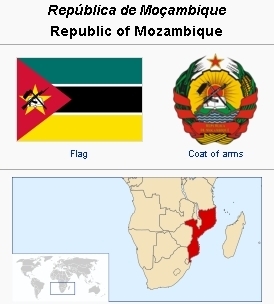 14 April 2011. http://en.wikipedia.org/wiki/Mozambique. Shenk, James W. and Richard D. Thiessen. "Mozambique." Global Anabaptist Mennonite Encyclopedia Online. April 2011. Web. 22 Apr 2019. http://gameo.org/index.php?title=Mozambique&oldid=122111. Shenk, James W. and Richard D. Thiessen. (April 2011). Mozambique. Global Anabaptist Mennonite Encyclopedia Online. Retrieved 22 April 2019, from http://gameo.org/index.php?title=Mozambique&oldid=122111. Adapted by permission of Herald Press, Harrisonburg, Virginia, from Mennonite Encyclopedia, Vol. 5, p. 604. All rights reserved. This page was last modified on 14 May 2014, at 07:35.